Let’s face it. We all have more stuff than we need. Whether it’s clothes crowding out our closets or boxes of junk filling up our garage; the fact of the matter is, clutter can quickly take over your home. Decluttering can be a daunting project to say the least, but with these 5 simple tricks you can be on your way to cleaner less cluttered home today. 1. Give your clutter a due date. We all have that one project (or two) that we keep putting off, because its important but not really urgent. The more we put off cleaning up clutter the worse it gets. So whether it’s the closet, the garage, or somewhere in between, pick a date right now for when you will have your project finished by. Then stick to it! 2. Give away one item each day. We are all less likely to start projects that seem big. The best way to manage big projects is to break them down into lots of little easy steps. Get rid of just one item a day and you’ll be surprised by how quickly that mountain of clutter disappears. Studies have shown that the rooms where people pile up the most junk tend to be poorly lit. Whether its natural light from opening up a window or overhead electric lighting, you’ll find that a well lit room is inviting to guests and uninviting to clutter. 4. Fill one trash bag. A trash bag is the perfect size to make a real dent into your decluttering project without taking up the whole afternoon. Trash bags are also perfect for donating those used items to charity. Donating used items to charity gets them out of your way and keeps them out of overcrowded landfills. Once you see your old stuff in a trash bag rather than clogging up your closet you’ll begin to feel a real sense of success. 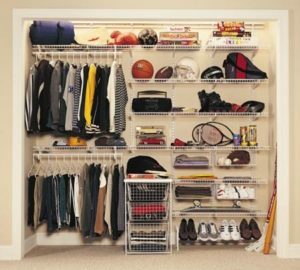 This idea is so simple but it really helps to identify what wardrobe pieces you actually use and which ones can be cleared out. You start by hanging all your clothes with the hangers in the reverse direction. After you wear an item, return it to the closet with the hanger facing the correct direction. After a few months, you’ll have a crystal clear picture of which clothes you can get rid out without missing them. The great thing about this experiment is that it can be done in pretty much any room from the kitchen to the office. Wondering what to do with all of those clothes that you want to get rid of? Don’t throw them away! One new App entitled GiveIt, is changing the way that people deal with clutter. The folks at GiveIt are offering a revolutionary free donation pick up service. All you have to do is 1. Download the app 2. Take a picture of the clothing or other small house hold goods you’d like to donate 3. Leave the items outside your door and let the GiveIt team take it away absolutely free. Together, you and Giveit can declutter your home while at the same time reducing waste. Visit http://www.giveithub.com/ today to learn more.